Albert Marque (14 July 1872 – 1939) was a French sculptor and doll maker of the late 19th and early 20th century. Marque was born in 1872 in Nanterre, Hauts-de-Seine. He became well-known and respected at the turn of the 19th to the 20th century, especially for his sculpting of children. During World War I, Albert Marque was persuaded by the Parisian couture fashion house of Jeanne Margaine-LaCroix to sculpt one hundred fashion dolls, which were then clothed in custom-made outfits. 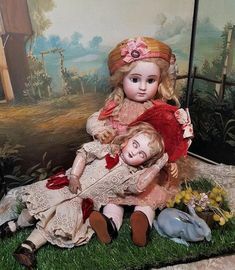 in 1915, these dolls were exhibited in Paris. Some were sold and others were kept in the Margaine-Lacroix inventory. The dolls were dressed in costumes, often representing regional French royalty or peasantry. 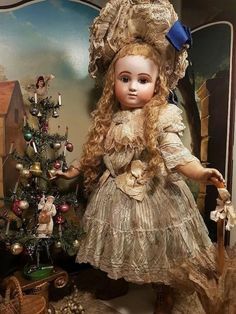 They are considered to be artistic works celebrating France and French culture, particularly as a response in wartime to the popularity of German dolls, and created for adults rather than as toys for children. These dolls became known as “A. Marque” dolls from the mark placed on the dolls by the sculptor. It’s interesting to note the top of the head is cut level, not on a slant as other French dolls. The body was made only for this doll and had unusual side-jointed hips with an attached ball in the joint. Legs are long and slender. Arms below the elbow are bisque and hands were modeled with the same skill as the head. 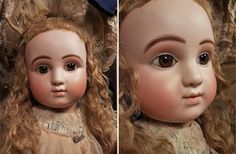 The sculpture of the face is a different from other dolls. Features are sharp and well defined. Ears protrude like a real child. While the forehead curve is typically minimized on French dolls, this is not true of Marque dolls. The Marque had blue or brown paperweight eyes and a closed mouth. All Marque dolls were 22” tall. All were made from the same mold and have the same body. The dolls have become highly valued in doll collecting. 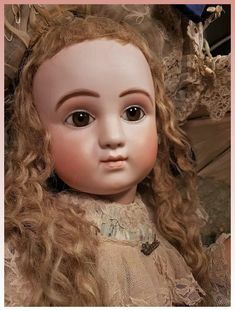 They are generally considered the most desirable dolls by collectors and demand the highest price of any dolls. 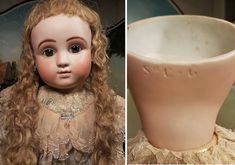 On July 15, 2009, an A. Marque doll set the world record for an antique doll at auction, fetching US$263,000. This broke the previous world record, also held by an A. Marque doll, of US$215,000. The following educational PDF was created for The Doll Artisan Guild. It contains a lot of interesting information on the A. Marque dolls.